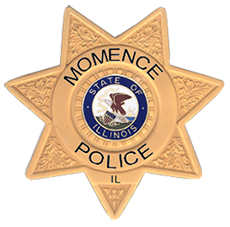 The Momence Police Department currently has no openings for employment. I would like to extend my deepest gratitude to Mayor Steele and the council for allowing me the opportunity to become Chief of Police. Having served as a local Police officer and Detective for over 17 years, I am now prepared to take the next step and provide our growing community with a strong, positive, team building leadership. I meet all the necessary experience, educational, and skill-based requirements for this position. However, my experience and education does not fully indicate the level of dedication I can offer to the City of Momence. I understand the different roles that the Chief of Police takes on; City spokesperson, head investigator, liaison to the City Council, role model and disciplinarian. 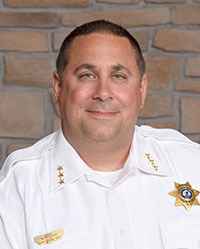 I have resided in Momence and that makes me an invested Chief that wants to see the Police Department thrive and grow. In addition, I am a strong advocate of progressive ideas and continual development. As laws, technologies, and times changes, so must the City of Momence by adapting with new law enforcement strategies, policies, and implementations. One of my central goals as Chief of Police would be to introduce new programs that further promote Momence's reputation as a safe, attractive community. This would be done through community policing, working with Momence School District, working with all local businesses and actively working with Kankakee County and the surrounding law enforcement agencies. I envision the police department doing even more to make Momence the type of community that encourages businesses and families to make it their permanent home. On October 16th, Officer Malloy was involved in a rollover car accident on his way to work. He was driving on a rural country road, when he was t-boned by a driver that failed to stop. Officer Malloy has a long road of recovery ahead of him. He has made great progress in a short period of time. He will be required to stay at the hospital for an extended period of time and will require a rehabilitation program after the hospital. There will be many medical expenses that the family cannot afford. 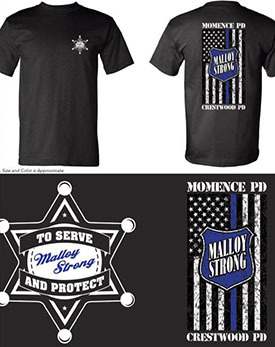 The Momence Police Department has set up an account for Officer Malloy to help ease the financial burden for his family. The Police Department will be selling t-shirts (Sm - XL are $15 and 2XL are $17) and bracelets are $5. Everything has been ordered and we are waiting for delivery. All proceeds will be donated to the family for medical costs.